Front of the recipe card for Dumplings. 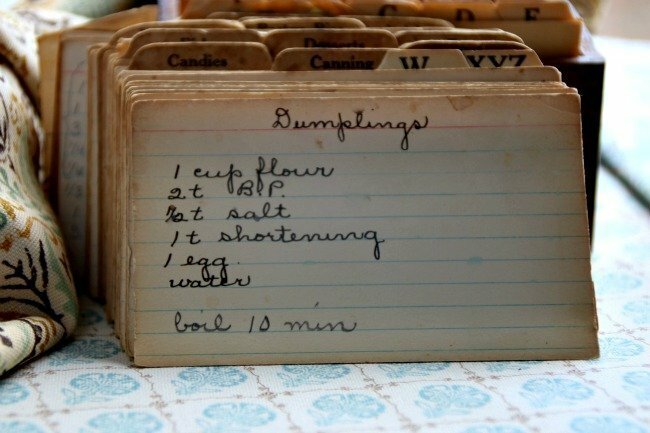 There are lots of fun recipes to read in the box this recipe for Dumplings was with. Use the links below to view other recipes similar to this Dumplings recipe. Billie, there are all kinds of ways to make dumplings. Some people in the South make flat dumplings (sometimes called slicks, I think), but my family (both the Southern and the English sides) made fluffy dumplings. I use butter in mine because I don’t use shortening for anything. 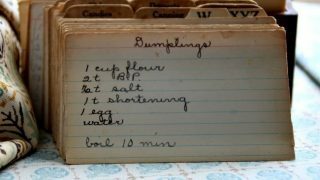 I’ve re-created a lot of family recipes that were never written down — for other people as well. Such fun! This is a wonderful project you have going!